The motorcycle segment in India has evolved with time as there are now multiple offerings across any given price range. However, the one particular segment that has reported a strong growth in domestic as well as international markets is the touring segment. These are the motorcycles that offer comfortable rides across long distances. Until a few years ago, Indian customers didn't have much choice but to shell out a premium for a comfortable tourer. But not anymore. The strong demand for tourer motorcycles in India has now opened a new entry-level class where almost every two-wheeler manufacturer wants to establish its presence. Also, with a growing exposure to the international trends, customers seeking an entry-level tourer have an exhaustive wishlist. In addition to the comfortable ride, there is a strong emphasis on styling, features, efficiency and also safety. Starting with the styling, it is no longer just about aesthetics but a well finished product that scores highly for the Indian audiences. A strong build quality also ensures a higher resale value when the customer wants to upgrade later. The other aspect is the list of features that play an influencing role in taking the final decision. The higher efficiency of the engine ensures a longer ride without taking unnecessary fuel stops. This also makes long distance riding a practical affair. And lastly safety. This has to be the strongest aspect in the motorcycles. While there are some brands that tend to overlook this and instead offer more features to compensate for the lack of safety, which we believe should be a standard affair. 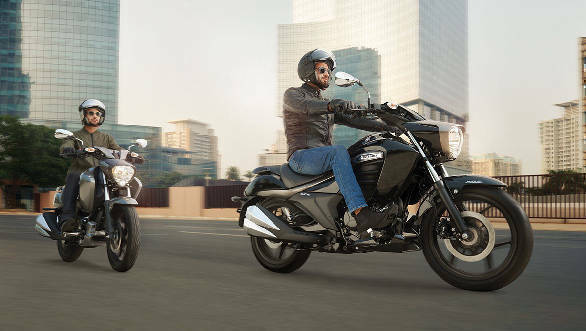 Among the different entry-level offerings, the Suzuki Intruder 150 is the latest entrant. Since it takes its brand name from the legendary large displacement cruiser, the Intruder 150 comes equipped with a host of best in class features. The styling is an extension of the larger offering while digital instrumentation, dual exhaust, LED tail light, etc make it a feature rich offering. Riding on a proven platform, the single-cylinder 155cc in the Suzuki Intruder makes 14.8PS of power at 8,000rpm and generates 14Nm of torque at 6,000rpm. Both of which are ideal to tackle city traffic as well as long distance highway touring. And the clinching fact that the Suzuki Intruder 150 comes with ABS as standard makes it the one of the safest among its rivals.